scenografic, beeing characterized by a central body overlooking the Arno with two parallel wings extending as far as Palazzo Vecchio. It is the Vasari's masterpiece in the late renaissance, mannerism architecture. The project was completed in 1580 by their respective successors Buontalenti and Francesco I, who provided for the arrangement in "The Gallery" of the Medici's art collections. It was the first time in Europe for the modern concept of museum... Since the 16th century the Uffizi Gallery continued to be enriched by acquisitions of art collections following the power of the Medici family. In 1737 Anna Maria Luisa, last of the family, left the museum to the city of Florence. Today the Uffizi Gallery is one of the most important museums of painting and sculture in the world where is possible to admire, in chronological succession, the Italian Painting of the 13th-14th, 15th, 16th, 17th and 18th century including works by Giotto, Piero della Francesca, Filippo Lippi, Botticelli, Mantegna, Leonardo, Raffaello, Michelangelo and Caravaggio. The museum includes the prestigious Collection of Prints and Drawings "Gabinetto Disegni e Stampe degli Uffizi" and the Contini Bonacossi Collection. 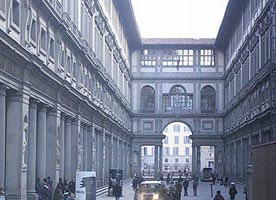 Following the construction of the Uffizi, Cosimo I commissioned the Vasari "secret" corridor to connect the political center of the city with Palazzo Pitti, the new grand-ducal residence on the other side of the Arno. The Vasari corridor is a raised passageway (about 1 km!) starting from the Uffizi and crossing the Arno above the Ponte Vecchio. The corridor houses a precious collection of self portraits from the 17th till the 20th century.